While it’s not obvious, you can preserve your album order in an export. Apple's Photos app on the Mac has a lot of hidden features that you can’t easily discover, because the options don’t live quite where you expect them—especially if you used iPhoto for many years, and still feel like you’re missing features. Macworld reader Lisa created a Photos album from different camera sources, and dragged the images into the order she wanted. But she then wanted to export these to duplicate this order for creating an album and an archive elsewhere, and was stymied. Is there a way to mark images in sequence? There is: in the Export dialog. Select the images in your album. 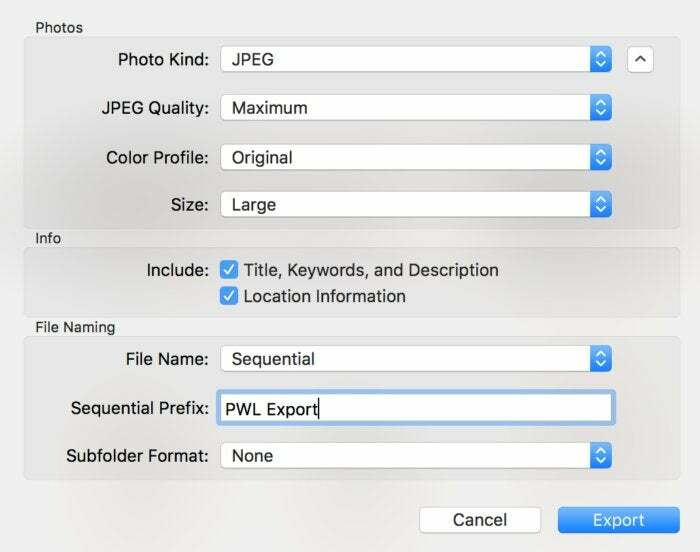 After picking any option in the Photos and Info section, under File Naming, click the File Name pop-up menu and choose Sequential. Optionally add a prefix that will be prepended in front of the number assigned in order to each image. Voilà! Numbered images in album viewing order. Export images sequentially to preserve album order as a function of sorting by name. Apple unfortunately doesn’t insert leading zeroes nor have an option to do so, and that will cause problems when you upload files elsewhere. In macOS, the Finder sorts numbers in ordinal fashion, so you get 1, 2, 3, 4, 5, 6, 7, 8, 9, 10, 11, 12, and so forth. On other systems, including web-based apps that you might upload images into, the order might be sorted using a different method of evaluating numbers as text, ignoring the progression that Apple exported. For example, you might see it in the order 1, 10, 11, 12 to 19, then 2, 20, 21, and so forth. If you have fewer than 100 images, you can insert a 0 manually before images 1 to 9. But if you have more than 100 images or will wind up exporting this way many times and then importing elsewhere with the wrong order, A Better Finder Rename ($20, free trial) has a truly ridiculous number of renaming options that will help you massage the export from Photos into whatever you need.